To help aspiring novelists achieve their goals of success. Writer must register with both PublishingRoom.com and WritingRoom.com. Submissions must be between 50,000 to 125,000 words. Writer must publish their manuscript with PublishingRoom.com. The purchase of additional services is not required, but it is encouraged. A confirmation e-mail will be sent out when the judges receive the book. If author does not receive an e-mail after reasonable shipping period, please send e-mail to contest@WritingRoom.com as both requirements may have not been received. Please note: you must complete the following by the deadline: 1) send your e-mail submission form 2) finish publishing your entry through PublishingRoom 3) place an order for three copies of your published book through PublishingRoom. Winners will be notified by Lindsay Preston (CEO-WritingRoom) through their registered e-mails. Top 10 submissions will be contacted by Lindsay Preston starting August 20, 2009. Top 10 winners will talk with Jon Land via phone or video conference to discuss his advice, suggestions, and ideas during this review process. Top 10 winners will be able to communicate on a weekly basis (one phone call per week) with Lindsay regarding any editing or revision questions. Top 10 winners will have two months to re-write, edit, and revise their manuscripts. Final manuscripts must be e-mailed to Contest@WritingRoom.com by October 20 with "Authors Choice Contest Finalist" as the subject line of the e-mail. Top three winners will be announced on November 21, 2009 via entrants e-mail and blog post. 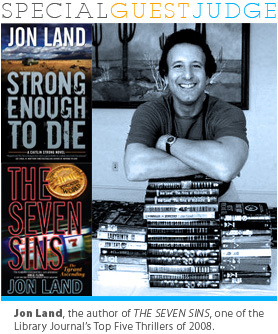 Recently hailed as "the greatest thriller writer alive today" by Bookviews, screenwriter and novelist Jon Land is the author of 27 books, 16 of which have been national bestsellers. Jon is published in more than 50 countries and six different languages, including German and Japanese. There are currently almost 7 million copies of his books in print. "Jon Land shows a true feel for detective work and the irony of pursuing elusive principles of justice in a region torn by ancient strifes," proclaimed the New York Times Book Review on A WALK IN THE DARKNESS (2000). "A full-bore thriller." Finalists will receive advice, help, and guidance from both Jon Land and Lindsay Preston to help improve quality and overall marketability of their books to a wide audience. Due to tough economic times and an overwhelming response to the contest, we have decided to revise the terms and extend the timeline for WritingRoom's Author Choice contest. This contest is sponsored exclusively by WritingRoom.com.